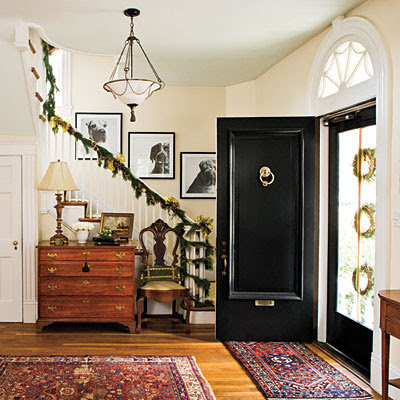 From simple to ornate, from traditional to contemporary, there is an array of ways to create a welcoming atmosphere in your entry for the holiday season. As first impression always counts, take the opportunity to create a wow-worthy setting that will both impress your guests and make them feel welcome. Furthermore, the entry area will set the tone for your whole holiday décor. An easy, budget-friendly approach is to repeat colors, textures, patterns, and décor elements that already exist in your interior and express your style and personality and add just some subtle yet impressive items, which can lend the space a festive look. 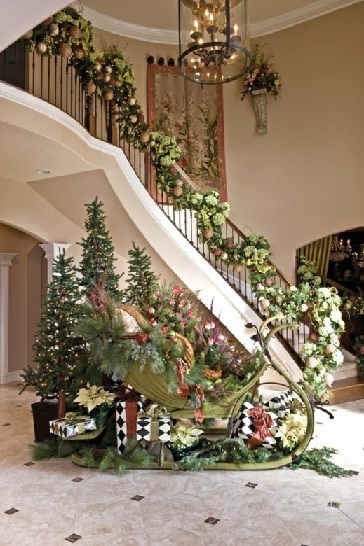 Whatever your choice is – light displays, a Christmas tree, wreaths, garlands, arrangements of glass balls, pinecones, and greenery, a greeting spelled with lit letters, or/if the space allows/ groupings of oversized glittering ornaments, when approached tastefully, anything works well and helps create a space that exudes warmth and festivity. When it comes to Christmas décor, always consider lighting, it brightens and embellishes the space and enhances the ambiance. Traditional Christmas décor is always a source of inspiration, modern techniques and ideas can add freshness and touches of unexpectedness. However, unleash your imagination and mix and match tradition and modernity to lend your entry area a truly fabulous look. Nothing says Christmas better than a Christmas tree, it is a part of the Christmas magic. Furthermore, whether a live tree or an artificial stylized one, it always makes a stunning statement. If the space allows, opt for a big live tree, it is definitely a feast for the senses. However, if tight on space, a smaller tree and even evergreen branch arrangements can also do the job. As for artificial trees, they offer a plethora of ways to embellish any entry area. A big or a small one, or groupings of artificial trees of different size for extra visual interest are options to add sparkle and charm. Consider using a pre-lit artificial tree. Available in different designs, shapes, sizes, and colors, it is an alternative to evergreens, which can add sparkle and personalize any entry area. Wreaths are a classic, favorite Christmas décor choice. Whether simple or ornate, made of different materials, in a variety of shapes and sizes, used alone or in groupings, they are a traditional, easy, and budget-friendly yet elegant way to deck any space for the holiday season. Unleash your creativity and come up with unique designs to add touches of festivity and unexpectedness to your entry area, when complemented by Christmas ornaments and/or lights, even a wreath in the traditional red and green colors can become a make-a-statement piece of décor. Being versatile décor, usually complemented by ribbons, bows, and Christmas ornaments, garlands can be used to embellish every corner, including for decking staircase railings. When combined, wreaths and garlands make stunning displays, which lend the entry space and inviting look with an organic vibe. As entry areas are usually with inadequate natural light, repurpose mirrors and glass doors. Hang a wreath that incorporates lights and/or sparkling ornaments to add some extra light, sparkle, charm, drama, and doses of the Christmas spirit to the space. Usually, string, fairy, and mini-lights are a favorite choice. In the picture above, an inviting entry. A potted Christmas tree, a trio of wreaths, a garland, and a swag, complemented by lights, small Christmas balls, ribbons, and bells make simple, affordable yet elegant seasonal décor. An arrangement of beautifully wrapped gift boxes adds to the Christmas feel exuded by the space. A gallery wall comprising black-and-white photos personalizes this truly charming entry! Above shown, entry décor with an organic vibe. 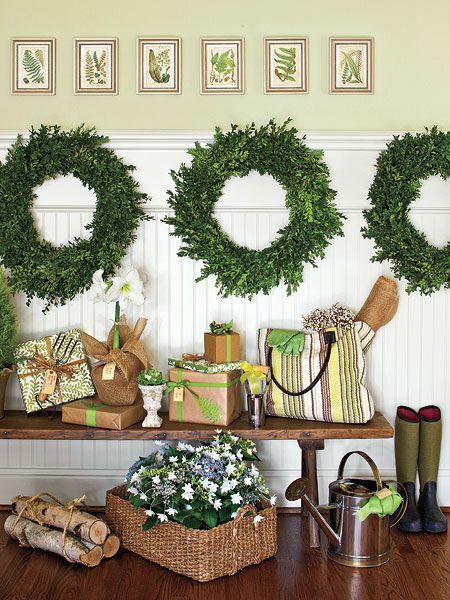 A trio of wreaths hung along the wainscoting adds touches of unexpectedness and makes a stunning statement. Gift boxes in garden-inspired wraps, a flower arrangement in a wicker basket, and a series of botanical prints used as wall décor bring color, extra freshness, and tons of personality. When considering Christmas décor, focus on lighting and make the entry glisten with a holiday feel. Lights are definitely a key element in holiday décor because light displays brighten the holiday season and add undeniable charm to the entry area. Unchain your creativity and think outside the box because when used in an unexpected way, lights can completely transform any entry for the holiday season. Furthermore, lights not only add interest and visual appeal but also accentuate other décor elements. Fresh or faux garlands or swags intertwined with glowing lights, lit letters in colors that match the décor and spell out a greeting, white spray-paint dusted twigs decorated with droplights, containers of different design, shape, and size with glass ball ornaments or pinecones complemented by strings of light, pre-lit ornaments, such as snowflakes and silver stars, the options to choose from are endless. However, always keep in mind that when it comes to lights, safety should be a major consideration. As they offer a safe, energy-efficient, and eco-friendly solution, opt for battery-operated string LED lights. Versatile and easy to use, they shine more brilliantly than other lights, consume less energy, emit less heat, come in a variety of vivid colors, and help create dazzling light displays, which can beautify the entry area for the holiday season. Incorporate candles to create centerpieces and vary their shape, size, and color for extra visual interest, and the more, the better, their twinkling light creates a feeling of warmth and coziness. For safety reasons, use battery-operated candles. Lanterns are also an option to add some extra charm and personality to the entry area Christmas décor. Generally, as they can make anything look magical, lights are a stunning way to decorate with for the holiday season. In the picture above, in this entry area, creatively positioned, multiple candles help create an inviting atmosphere and bring dashes of the Christmas magic. 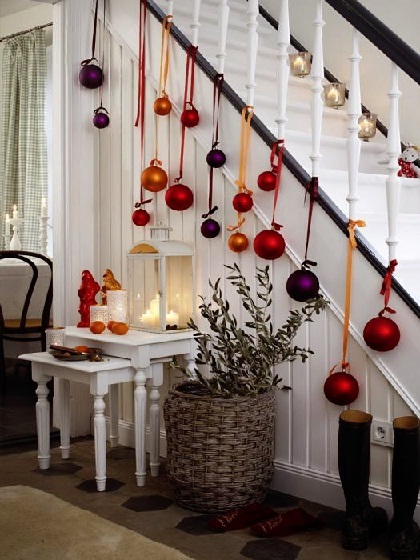 Baubles of different color and size hanging from the banister base add extra sparkle and charm. Simple yet so adorable! Above, an eye-grabbing holiday season arrangement. 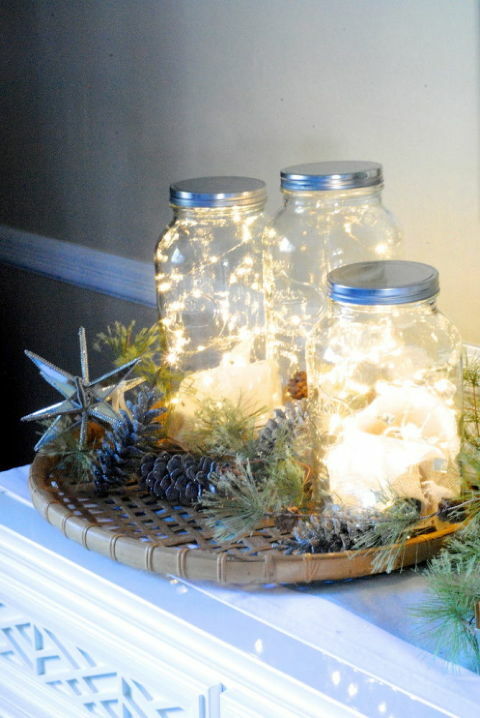 Mason jars of different height filled with LED fairy lights are complemented by pinecones and branches of evergreens. Simple, easy to make, and affordable yet so adorable! 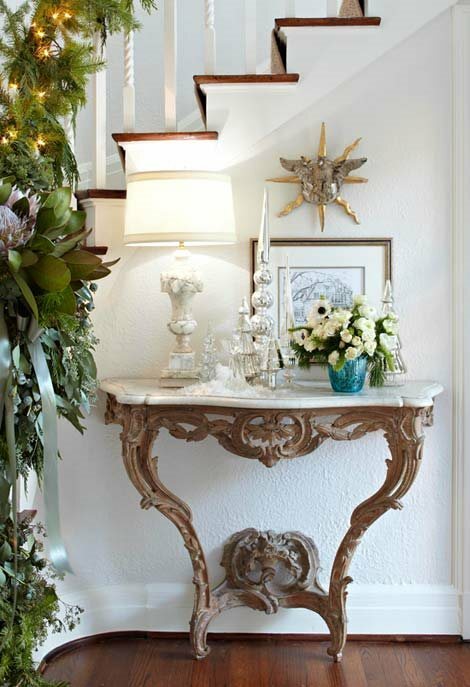 Entry table arrangements are a favorite Christmas décor choice. In addition to creating a welcoming atmosphere for the holiday season, entry table décor helps personalize the space and bring extra sparkle and dashes of the Christmas magic. The options for decorating are limitless, anything from silver stars, snowflakes, and glass ball ornaments to odd-numbered groupings of containers nestling multi-colored lights to traditional wreaths and color crêpe paper ornaments to shining orbs can do the job, it all depends on the homeowners’ taste and preference, as well as on the size of the table. However, opt for repeating décor elements to lend the overall Christmas décor a coordinated, harmonious look. 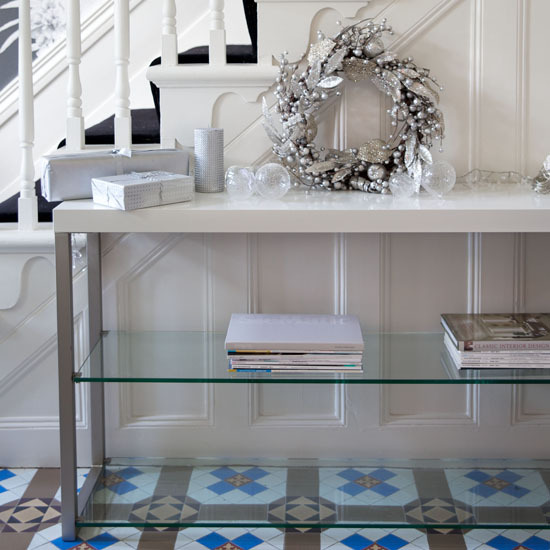 In the picture above, entry table Christmas décor in silver and blue. An eye-grabbing grouping of shining silver ornaments of different shape and size is complemented by a blue vase with flowers. Pieces of art add extra style and visual interest. Staircase décor brings color and freshness. So simple yet elegant and sophisticated! Shown above is an elegant entry table arrangement. A sprayed wreath complemented by glass baubles, silver candles, and beautifully warped gift boxes lends the space a modern, chic look. Stunning flooring adds personality and visual interest. When it comes to staircase décor, it is a way to add some extra touches of festivity, as well as color and visual appeal. Usually, garlands, swags, and wreaths, natural or faux, lit or not, complemented by ribbons, bows, and baubles make stunning staircase décor. 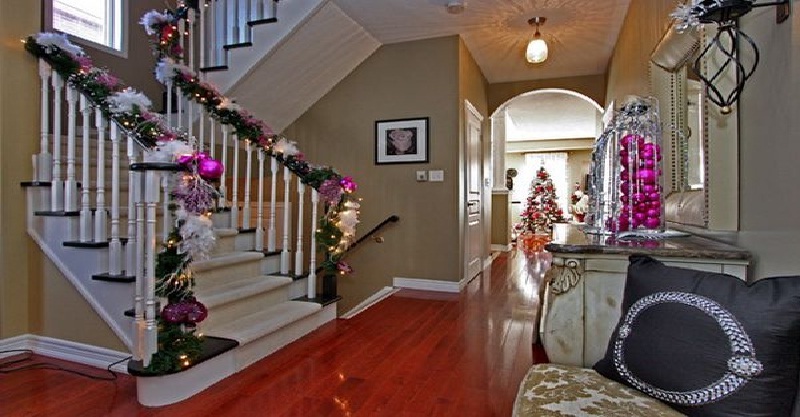 In the above-shown picture, a magnificent entry with opulent, breathtaking Christmas décor. Above, an entry with a timeless look. A garland complemented by bows and baubles helps create an inviting, festive atmosphere for the holiday season. Sometimes, everyday items used creatively, in an unexpected way make simple and budget-friendly yet impressive décor. 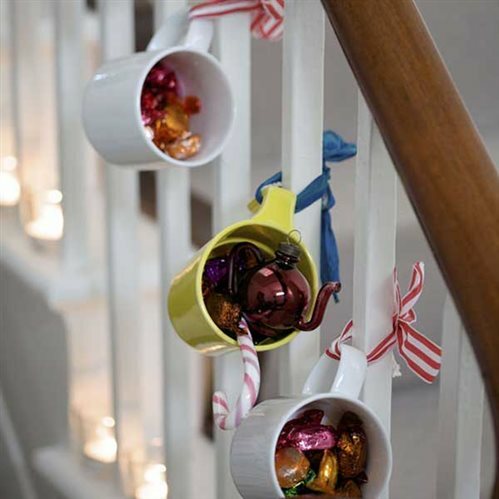 Above, mugs filled with treats are attached to the staircase spindles with colorful ribbons. So adorable! Unleash your creativity and deck your entry with seasonal décor to create a festive feel for the holiday season and help spread the spirit of Christmas in your home.